Energy is imperative to growth and sustenance of all animals, and plays a major role in the production of milk by a dairy cow. It is supplied to dairy cows through the feeding of pastures, supplements and concentrates. The proportion of each varies according to need and availability. Pastures grown on the farm are the most cost efficient and sustainable source of energy for conversion to milk. Concentrates and supplements, which are brought onto the farm, are necessary, but are expensive. Providing energy through these sources, when not done efficiently and according to the cows’ need, are not a very sustainable method of supplying energy to dairy cows. In order to ensure that the pasture grown on a farm is fully utilized and not wasted, it is important for farmers to know how much pasture they are growing and how much energy these pastures provide. The amount of energy supplied by pastures is based on the NDF. NDF in pastures is affected by various factors such as climate, pasture quality and season. In order to become more efficient, both in utilizing pasture grown on the farm and minimalizing the need to bring in expensive concentrates and supplements from off of the farm, farmers need to develop the practice of recording pasture growth and NDF. They also need to ensure that they are not over allocating energy to their cows, which will generally just be wasted and not necessarily result in greater milk production. 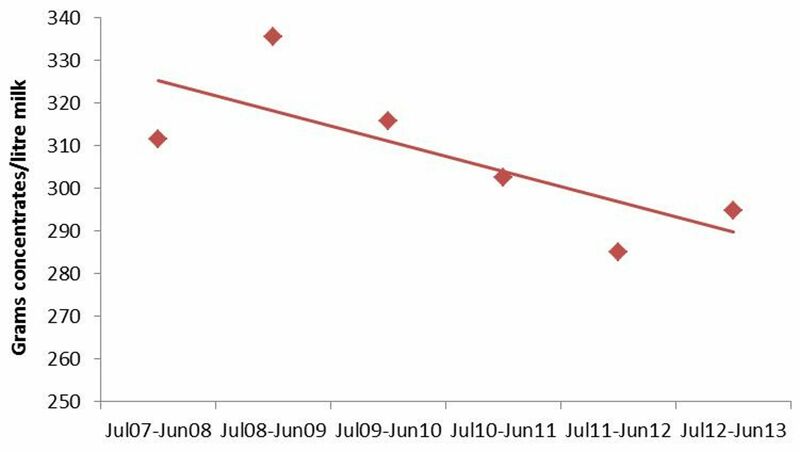 The graphs below show the improvement in pasture utilization and the resulting decrease in concentrates fed on a farm in the Tsitsikamma area of the Eastern Cape, South Africa. Figure 1 specifically shows the percentage contribution of pasture and concentrates to the total energy requirement of a lactating dairy cow. 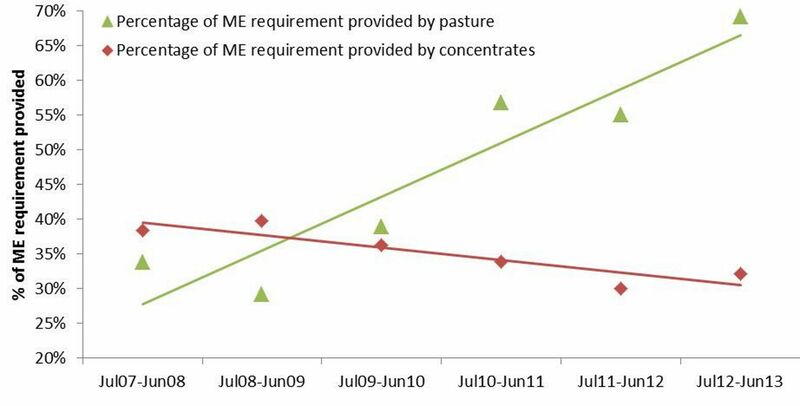 The farmer has managed to do this by lowering the amount of concentrates fed (Figure 2) and increasing the pasture produced (Figure 3) on his farm. By ensuring that he has efficiently utilized his pastures and reduced the amount of concentrates he has fed, this farmer has saved himself money and increased his profit margin. He has also reduced his environmental impact, and reduced his reliance on external sources of food for his cows, which has resulted in him having more sustainable farming practices. 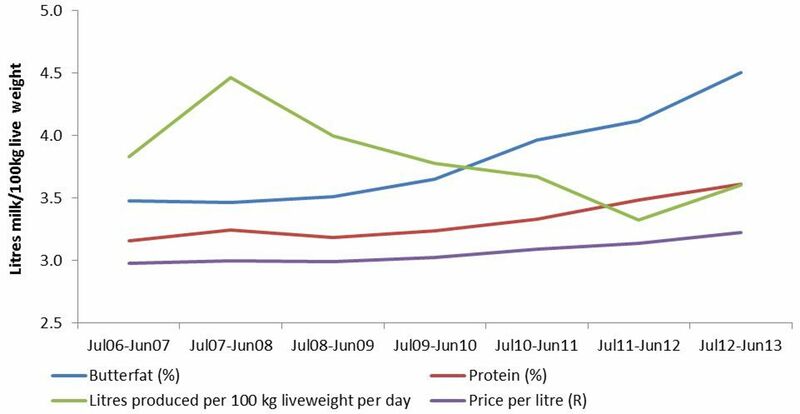 Although there has been a decrease in milk production on the farm (which has been displayed in litres of milk produced per 100 kilograms live weight per day in order to ensure comparability over time), there has been an increase in butterfat and protein content in the milk (Figure 4). This shows that the reduction in concentrates fed and the greater reliance on pastures has also not resulted in a greatly negative impact on milk production. 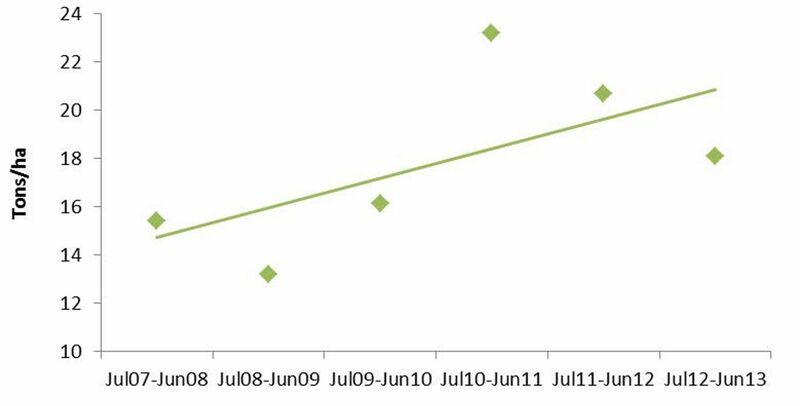 It must be noted though that the change in milk production and milk solids is linked to the fact that the farmer started cross breeding and therefore reducing his cow size around the time that this data started being collected. The effect has been an increase in the value per litre of the milk though. This case study shows that it is possible to utilise pastures more efficiently, and that the result is the decrease in the amount of concentrates, while maintaining milk production. It is important for every farmer to consider where the feed energy on their farm is actually coming from, and whether the system they are implementing is the most efficient, productive and sustainable system possible.